We are having a HUGE problem here in Virginia Beach and nee your help. To make a longs story short, these menhaden boats are coming in and whipping out damn near everything! You know its bad when even your fellow commercial fishermen want you out! You would be a grand help if you could go to this link and hit the sign button! Everyone would greatly appreciate it! Charter boat captains the past couple of years have found a niche fishery along the coast that has helped fill the void caused by a decline in offshore trips for marlin and tuna. But in the past week, that inshore fishery has come to a screeching halt, and captains are pointing fingers at commercial menhaden fishing operations. Companies such as Omega Protein debunk that theory in a continuation of a decades-long conflict between recreation anglers and the menhaden industry. The latest difference of opinion includes a petition to Gov. Terry McAuliffe and a Facebook page entitled "End Menhaden Fishing in Virginia." The root of the debate is a small oily fish found along the coast and in the Gulf of Mexico. Menhaden is used by Texas-based Omega to produce Omega 3 supplements and pet food. The fish also is a filter feeder that helps keep waters clean and a vital early part of the game-fish food chain. Fishing for menhaden often leaves thousands of dead fish floating on the surface and lines of foam and fish scales left from separating the fish from the water. When the nets scoop up thousands of menhaden, the bluefish and mackerel that were feeding on them are either caught as a bycatch or move on to find other schools of menhaden to feed on. Sometimes, it takes months for angling to get back to normal after a menhaden operation, captains said. It also attracts big sharks to the tide line, where dead fish and foam get caught. Charter captains had been keeping busy by offering four- and five-hour coastal trips fishing for bluefish and Spanish mackerel, often using the fish as bait for quick shark-fishing trips a couple of miles off the beach. The trips have been a huge hit with tourists. "They're perfect first-time family trips and the sharks add an exciting element for tourists," said Trick Standing, captain of the Git-R-Done out of the Virginia Beach Fishing Center. "But since the menhaden boats were here Monday, it's gone from great to zero. It's horrible. There's nothing there right now." Omega officials on Wednesday acknowledged that their boats had been off Virginia Beach this week. 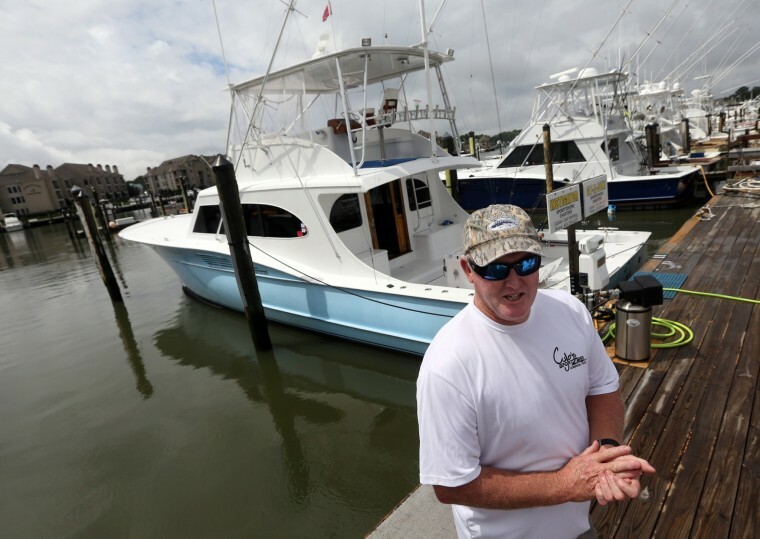 "We've given ourselves a self-imposed half-mile limit from the coast and with Virginia Beach in particular we try to stay away," said Monty Deihl, the director of fishing plant operations in Reedville. "We'll only go there if we can't find anything anywhere else. "This is the first time we've been off Virginia Beach this year." Omega operates in the state's reduction fishery for menhaden and has an annual quota of approximately 315 million pounds. A reduction fishery reduces the whole fish to other usable products. Other menhaden operations that catch fish for bait have their own quotas. Omega's Reedville operation is the only menhaden reduction fishery allowed on the East Coast. Federal fisheries managers have stated that the East Coast stock is in good shape, but local captains disagree. "Our fishing goes to crap after they set up," said David Wright, captain of the High Hopes. "Everything we're fishing for follows the bait around. They come in and now there's nothing. Fishing is lousy after they wipe out everything." Menhaden is the only fishery in Virginia not regulated by the Virginia Marine Resources Commission. Instead, it is governed by the Virginia General Assembly - a point that also does not sit well with the recreational angling community. But Omega said it operates within the law and reports all fish overflow from the nets. "We have VMRC people at our docks every day inspecting our catch," Deihl said. "We've had two incidents this year and the bait fishery has had two bad ones that we tried to help with. "We are in contact with VMRC whenever there is a spill and try to be as open as possible." Omega also contracts with a Norfolk environmental company that handles spills that reach the beach. "There's a lot of false rhetoric going on out there and it's too bad," Deihl said. "We're only allowed to take a small percentage of what's out there and there are huge biomasses." Standing wants to see Virginia Beach officials and the state come together with anglers to figure out a solution. "Some sort of medium like an exclusion zone along the oceanfront," he said. "Some way to protect us from the damage they do to our industry when they fish. "I don't want to put anybody out of business, but..."
Added Wright: "I'm pro commercial and have my licenses. But our small charter fleet has never been protected from what happens to us after they come through. The menhaden are of such high nutritional value to stripers that biologists report that their growth is affected when they have to eat something like pollack instead. We usually don't even get bunker north of Cape Ann anymore. Taking out a big chunk of the forage fish biomass cannot be good, no matter how many people say "there's acres of them"! Do you really think there's no correlation between the menhaden harvest and the stress on other fisheries? Decades old controversy of "who's slice of the pie should be bigger". I think that you are fighting a loosing battle Jeff. Wasn't the Givernor on record this past week supporting Omega? I'm surprised that the Menhaden fishery is even viable. In the fifties my father worked his way through grad school flying as a fish spotter pilot for the Menhaden fleets. The company he worked for fished N.C. to Long Island. - big fleets, several processing factories, and spotter planes based in several places. Dad flew out of S. Jersey. 1025, I hope my address doesn't disqualify my vote. Fish oil supplements are big business, as are the dog/cat and live stock food industries. Mr. Governor, we are asking that you please get involved and stop these bullies from endangering citizens and tourists, and make them be respectful of the city, its citizens, and our oceans. How does one force a person or company to be respectful? You either have respect or don't. I'd be more than happy to sign a petition banning Omega from netting Menhaden, but this petition does not request anything specific. I don´t know if my signature is valid, but I did sign. 443 more needed. Careful what you wish for fellas. If they shut them out down there, they'll be in our waters in no time.